Mary Oliver, winner of the Pulitzer Prize for Poetry, was described by the New York Times as “far and away, this country’s best-selling poet.” Her poetry collections include Swan; Blue Iris; Why I Wake Early; Thirst; New and Selected Poems, Volume One; and New and Selected Poems, Volume Two. Her prose includes Our World, which is a collection of photographs by Molly Malone Cook accompanied by Oliver's writing. 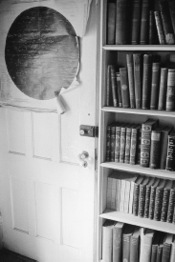 Edna St. Vincent Millay's library at Steepletop. Photo by Molly Malone Cook from the book Our World. Edna St. Vincent Millay died on October 19, 1950; she was 58. It was a too short, turbulent, diligent life—a life of life, a life of work. She was the first woman to win the Pulitzer Prize in Poetry. She was the chosen representative figure of the ’20s, beautiful, flamboyant, honorable to the spirits of love and of art, yet, in those early years, mischievous, even racy. In book after book, she wrote more deeply, more quietly, with a lyrical finery, a feminist stance, an affinity with the natural world, an understanding of the necessity in the world for kindness, for participation. The critics, with the exception of Edmund Wilson, have mostly hashed her work, making it smaller by emphasis on the early poems. Who remembers her libretto for Deems Taylor’s opera The King’s Henchman, or the plays, or the many elegant sonnets and poems in later books such as Buck in the Snow; Huntsman, What Quarry; and the posthumous Mine the Harvest? Or the essay Fear, really an open letter to the Governor of Massachusetts on behalf of Sacco and Vanzetti? That she had some bad times in a good life seems of higher interest to her biographers (so far) than the audacity of her spirit, the breadth of her work. Well, hundreds of readers—thousands of readers—young as well as old, do remember. Time will bring its balance, its more just correspondence between the poet and the work. To which she gave such unflagging effort, until the moment of her departure which was altogether too early. A Personal Note: When I was still in high school, in 1953, I wrote to Norma Millay, the poet’s sister, asking if I might visit the poet’s home, where Norma Millay was then living. The answer was yes. So, sometimes, the emboldened young fly into their lives. I lived there, off and on, for a good number of years. I don’t know if spirits always haunt their earthly homes, but I know that sometimes they do. Her presence was everywhere. Beacon Buzz: Gather at the Table, Faitheist, and more!